Home > Safety First	> How to protect my baby against household germs! How to protect my baby against household germs! Babyproof your home against household germs! This is necessary because germs are everywhere and all parents want what’s best for their children. Indeed, baby-proofing your home is a crucial step for the well-being of your child. People most often associate “babyproofing” with maintaining safety measures such as covering up the electricity outlets, setting up safety gates for stairs, using rubber bumpers for sharp corners, installing door stoppers to prevent hand injuries. etc. Many start to childproof their home in this manner when their baby starts to crawl around the house. However, what is often neglected involves something that are is – GERMS. It is especially daunting to find out that your house is filled with germs that can potentially be dangerous to your baby’s health. Baby-proofing your home against household germs is very important especially during the first year your baby’s life because at this time, the infant’s immune system is at its weakest point in his/her entire life. 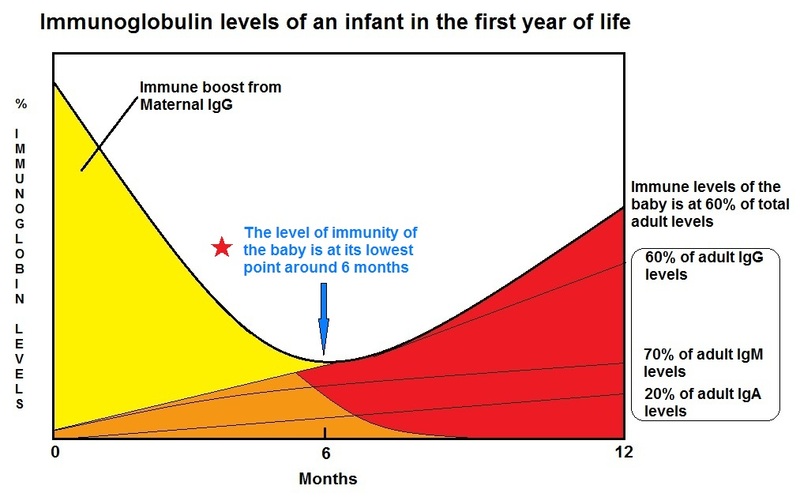 It is especially weak around 4~8 months when the mother’s immune influence disappears while the baby’s immune system is getting established. One can see that the immune system level of a normal child in the first year is at its lowest between four to eight months. At age one the total immune levels of the child is around 60% of the adult level. One important rule of thumb to remember is this – where there is moisture, there are bound to be germs. A University of Arizona professor Charles Garba, more famously known as Dr. Germ, did a study on household germs and found out that the number one place where germs lurk is the kitchen sponge or dishcloth. Number two is the kitchen sink, three – the bathroom sink, four – the cutting board, five – the kitchen floor, six – the bathroom floor, seven – the bathroom counter. It is interesting to note that the top items/places where germs lurk are associated with water in one way or another. With that said, if you have been using your sponge for more than one month, THROW IT AWAY! If it smells even after you finish doing the dishes, THROW IT AWAY! Sanitizing, boiling and drying it in the sun are ways to kill the bacteria living in the sponge. Some even recommend microwaving the sponge. (Please remember that this is a temporary fix because the moisture and food that remains within the holes and crevices of the sponge serve as a breeding ground for bacterial and fungal growth.) And about dishtowels, people do not realize that washing the dishes and then, wiping them down with a dish cloth that has not been cleaned, sanitized and dried properly will only dirty your dishes once again. Except this time around, a person may be fooled into thinking that the dishes are clean when in actuality they aren’t. As for the kitchen and bathroom sink, you should scrub and wipe them down with a disinfectant. The tub where your baby takes a bath is also filled with unseen bacteria and mold. As a remedy, baking soda is a great safe way to scrub down such areas. Using antimicrobial wipes on surfaces such as kitchen countertops, remote controllers, cellular phones, etc. is another convenient method for killing germs. And a diluted solution of bleach is an excellent way to sanitize things as well. In addition, a homemade vinegar solution can be used to clean things like humidifiers and even cutting boards. Cutting boards can harbor serious bacteria and are often items that are neglected. Disinfect them often! One should be careful when preparing food for your child. Having separate cutting boards for meats and fruits & vegetables is a must. Chicken can harbor diarrhea causing bacteria such as Salmonella and using the same cutting board to cut vegetables and fruits will bring cross contamination and create havoc to your baby’s digestive system. Even fish such as a mackerel are filled with parasites. Open up the belly of a fresh wild mackerel bought from your local grocery store and ten out of ten, one can see the parasite Anisakis wiggling around in the belly. If there are a lot of scratches and deep cuts within the cutting board, it is time to buy a new one. When babies start to crawl around with their hands and knees, those same hands are placed immediately into the baby’s mouth for bacterial ingestion. It is prudent to clean the floors especially the kitchen and bathroom floors. Purses and wallets are items that can not be sanitized but should be kept away from the hands of babies. As you already know, money is one of the dirtiest items in the world and you don’t want your child sucking on a dollar bill. Cell phones are another item which should be kept away from babies. Reiterating the point “where there is moisture, there are bound to be germs”, dishwashing machines that are not maintained and cleaned properly can harbor dangerous bacteria and fungi. It may by ironic in that people associate the word clean with a dishwashing machine but it is far from the truth. The filters of the dishwashing machines can be clogged up with bits of food that has washed down from the dishes. Sometimes pieces of food remains in the bottom of the dishwasher and that also allows for bacterial and fungal growth. Furthermore, not all dishwashers are equal and not all dishwasher detergents clean as advertised. Washing machines are another place where people are surprised to find that many bacteria and fungi thrive. Washing your clothes (especially soiled underwear) in regular detergent will not kill all bacteria. One smart way to use the washing machine is to do the colors first and the whites last. This way one can use bleach with hot water for the whites while at the same time disinfecting the washing machine during its last use. Afterwards, the washing machine door should be open to allow air drying. One cannot emphasize enough the need to clean your humidifier and change the water on a daily basis. For those who use them, take a cotton swab and run it across the insides of the opening where the steam/mist comes out. Most will find an orange or black color on the swab indicating mold and bacterial growth. In general, anything that is within the child’s reach should be wiped down and disinfected – especially things associated with food, water and items touched by many people. Besides babyproofing your home against germs, washing or sanitizing your hands before handling the baby is a great way to protect the baby and prevent the spread of germs. This is the first article in a series of upcoming articles addressing safety issues for our babies – Safety First. Hopefully this article provided a small insight to the importance and urgent need to babyproof your home against household germs.